We’ve got better hair! Better Hair! It oughta be the, the, the struggle against idealogical extremists who do not believe in free societies who happen to use terror as a weapon to try and shape the conscience of the free world. 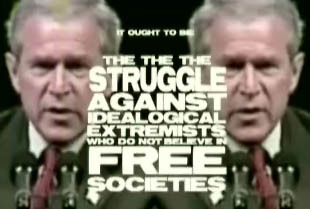 Yeah Georgie, screw the fancy “war on terror”, tell it how it is. Seriously folks, this video is worth it. Watch it at ifilm by clicking here. I would display more funny parts from the video, but you might as well watch the whole thing, it’s hilarious. "We’ve got better hair! Better Hair!" by Jeremy Felt, unless otherwise expressly stated, is licensed under a CC BY-SA 4.0 International License.